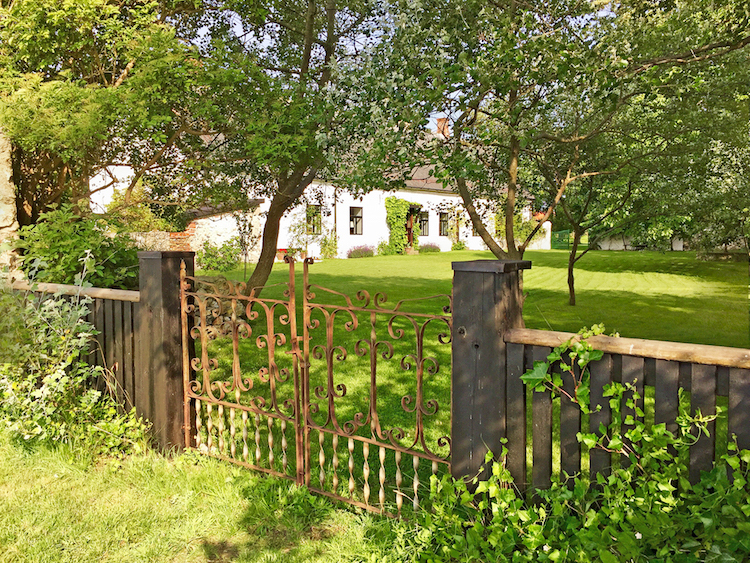 my scandinavian home: This Incredible Swedish Country Home By The Sea Could Be Yours! 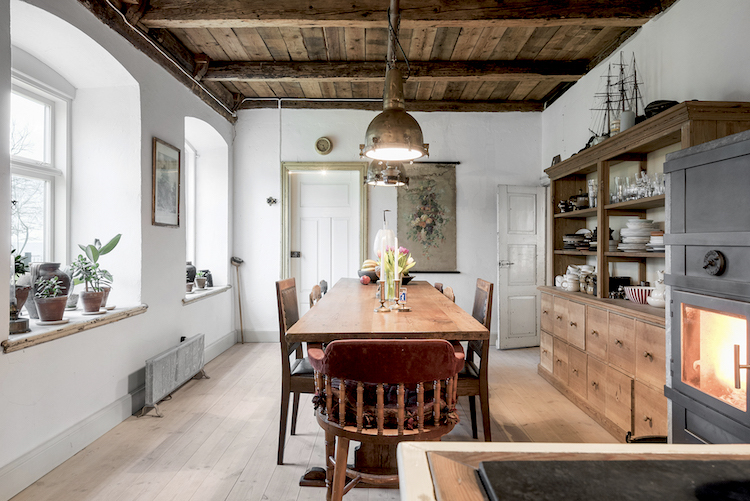 This Incredible Swedish Country Home By The Sea Could Be Yours! 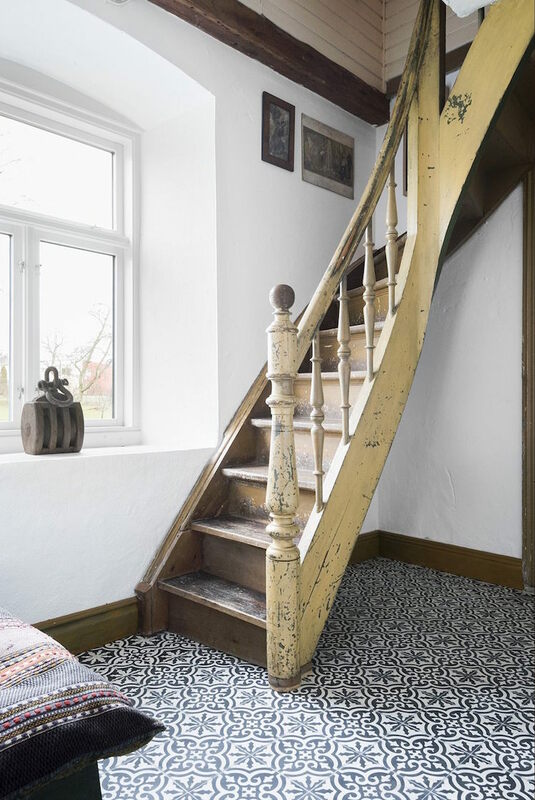 Do you ever dream of moving to the countryside (or perhaps you've made the move already?). 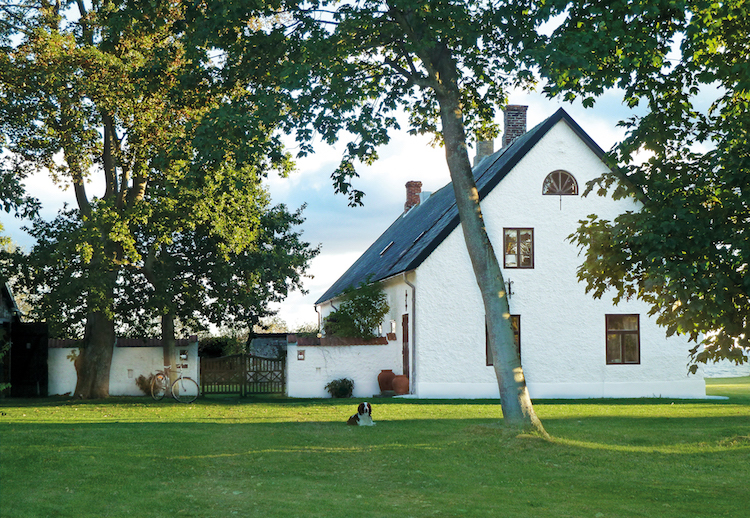 As a Londoner at heart, I'm so happy in our little townhouse in Southern Sweden, but that doesn't stop me from dreaming about living in a beautiful house in the country. 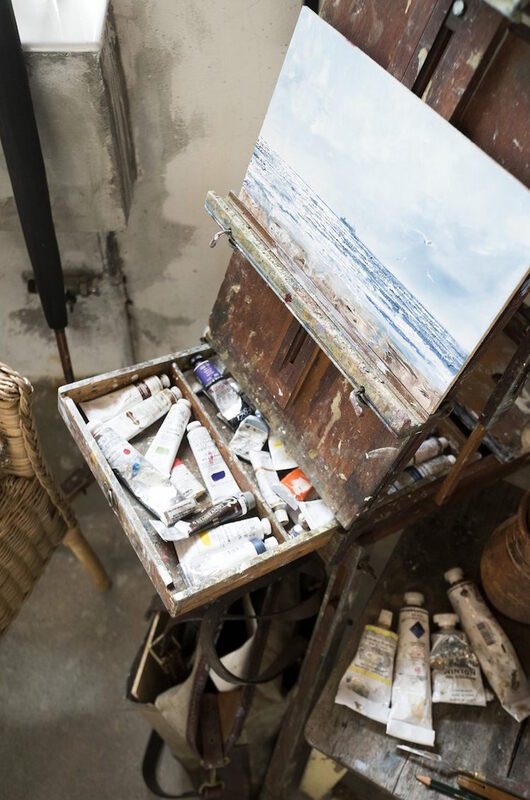 Somewhere old, somewhere with acres of outdoor space for our children to run riot, and somewhere with my very own studio atelier. Oh and did I mention the sea view?! Hmmm. Perhaps I'm asking for too much. Or so I thought. Earlier today I discovered exactly this on a real estate site!! 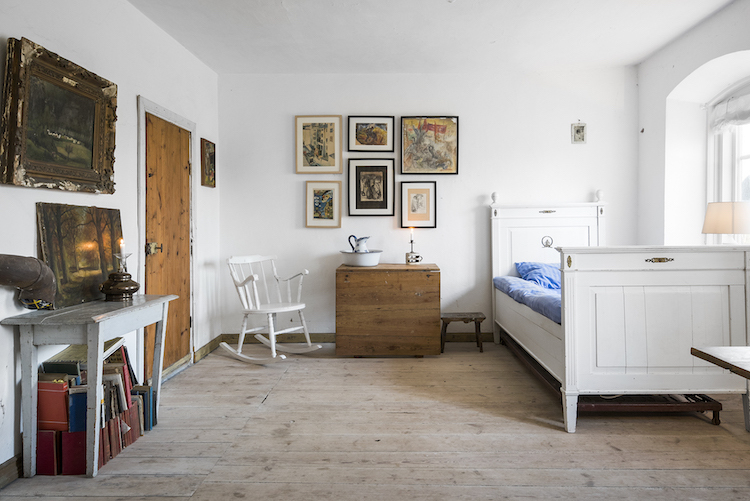 The artist's home dates back to the 1800's and is located right on the beach in Smygehamn (try pronouncing that!) 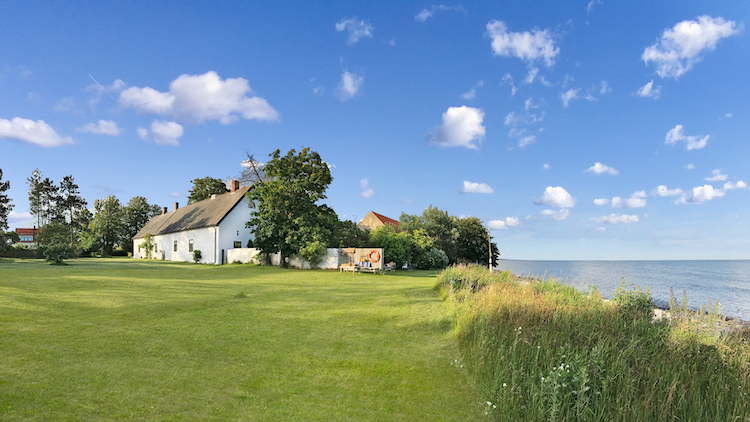 on Sweden's beautiful southernmost tip. 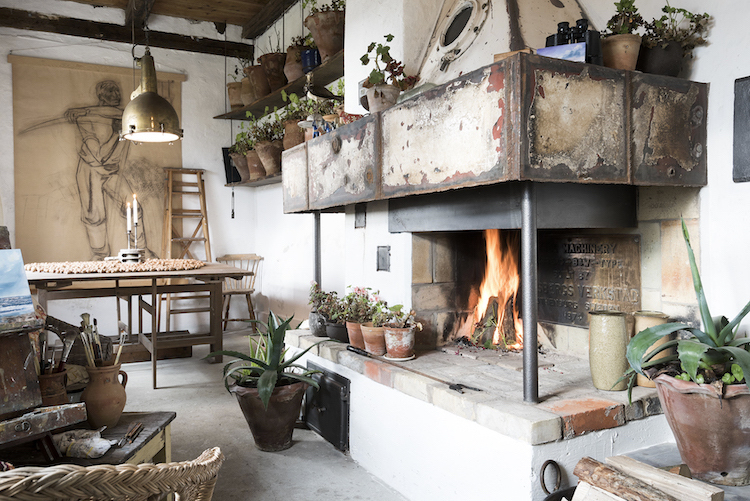 It also has the most incredible atelier (with it's own fireplace!) *heart skips several beats*! There's one slight drawback though. It's way out of my price league. Ah well. Perhaps we can share it?! 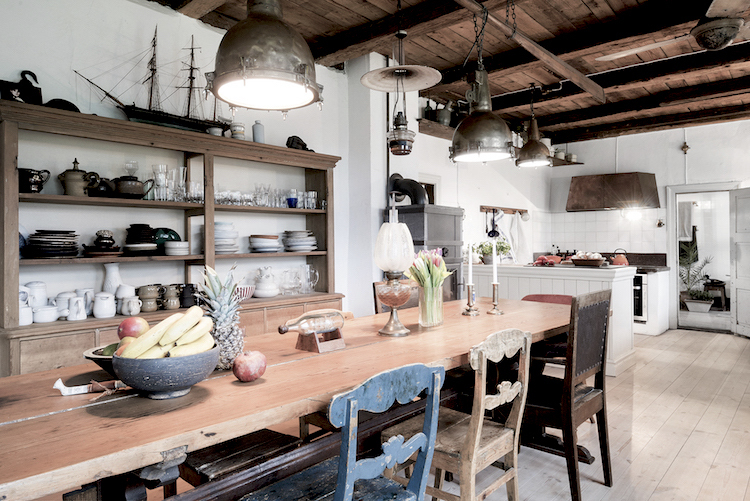 The bohemian in me loves traditional-style mix and match kitchens. 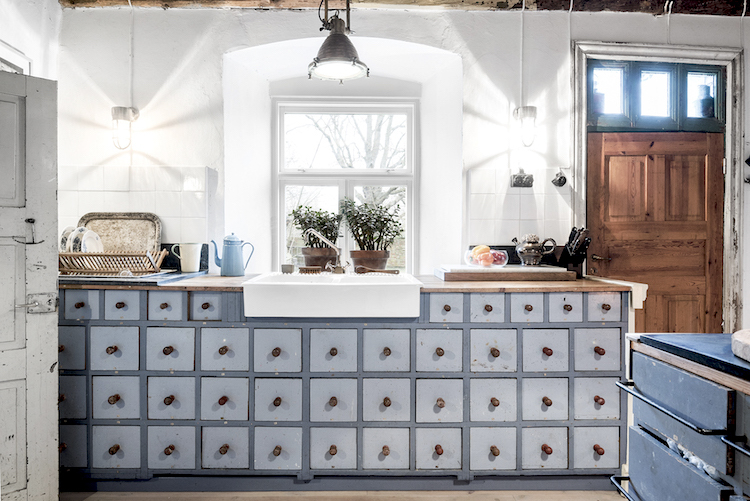 How pretty is this cabinet under the sink? Knowing my family we'd have a hard time remembering which draw we put things in, but it'd would be worth it all the same! 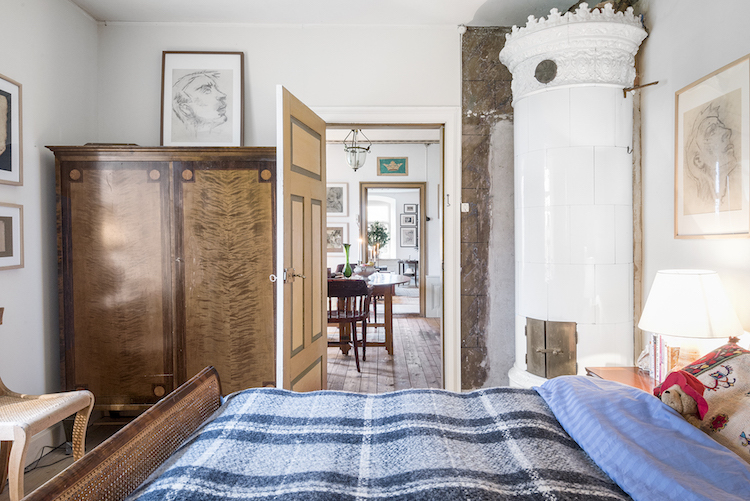 A traditional Swedish masonry oven in the corner of the bedroom is something I've always dreamed of! Loving the cane sleigh bed too (try Serena & Lily* for similar). 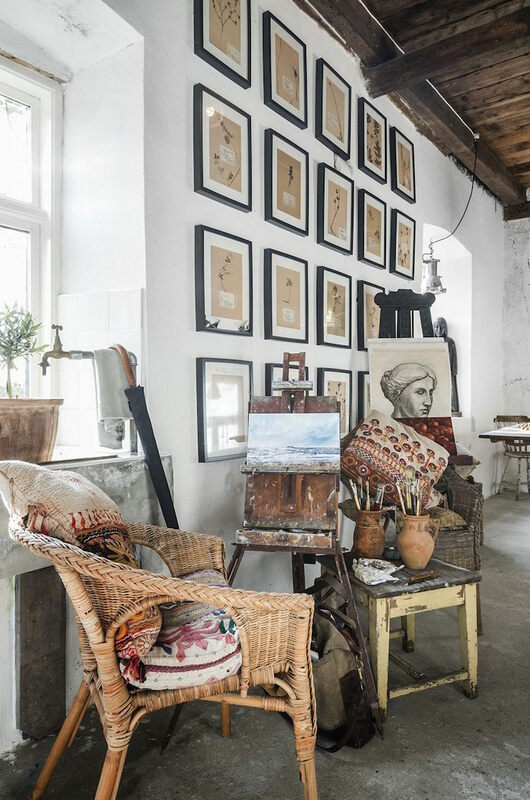 It's so inspiring how all the items are vintage / antiques of some sort. I'm thinking that if I ever make that move to the country this type of furniture would be high on my list. My Mother used to take us to loads of auctions in Sussex, England when we were kids (she collected antique chest-of-drawers like I collect cushions!!) and I've never really had the opportunity to do this as an adult. 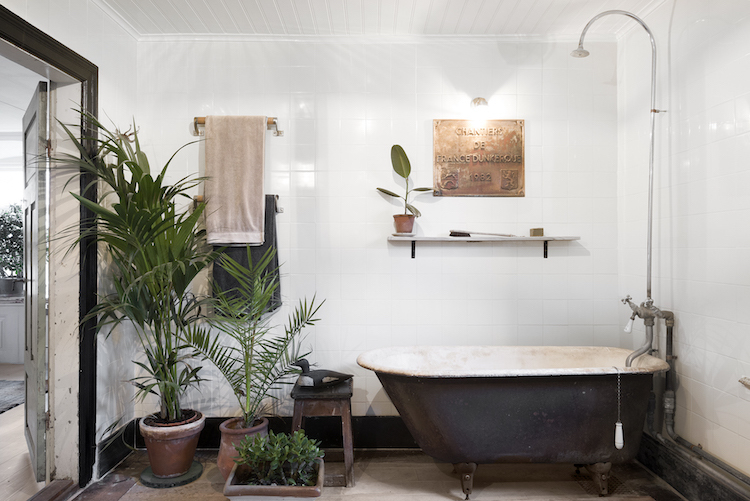 This bath is so pretty - and if you hop over to the rest of the pictures over at Residence you'll spy an original Thomas Crapper loo (I wonder how it found it's way to Sweden?!). This was the fireplace I was telling you about. I'm already picturing myself here in the winter. Would I get any work done ? Potentially not! But think of all the tea I'd drink while I looked out over the stormy waters! 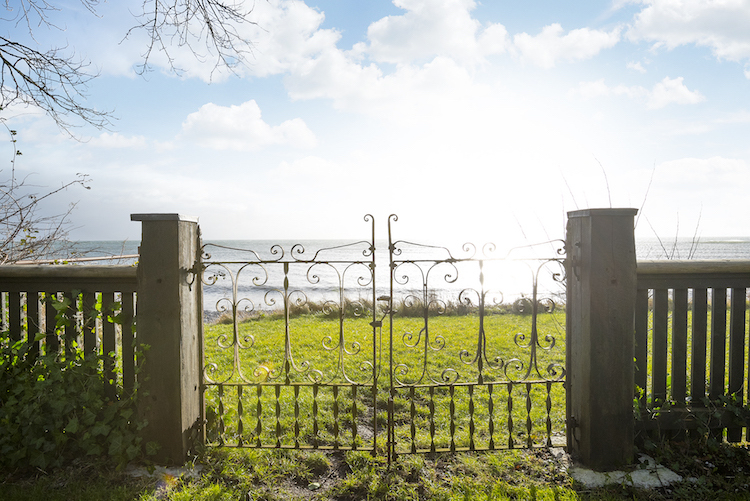 Anyone else envisaging themselves living here?! Me? 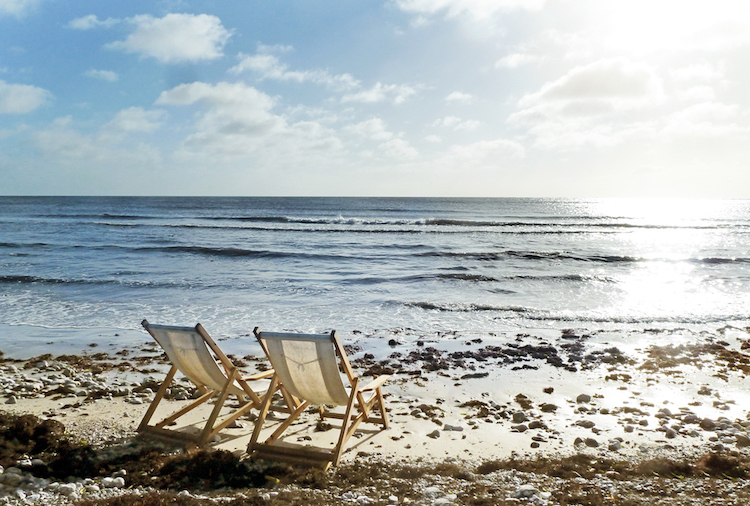 I'm already on one of those deck chairs (in my mind). Whoever buys this house is one lucky soul! Ha ha . I am the same as your mother. Vintagr chest of drawers,wardrobes and tables I have had many and varied. So cheap! Anyway hope you make it to your dream house soon.Best wishes. Most likely need to flip it before sea level rise swamps it. just being realistic. I read your blog its very interesting and valuable. I did forget to say, this home is drop dead gorgeous and shines with the warmth of generations of loving care. But sad that so many coastal properties may be uninhabitable in 30 years (or sooner). People who works there are some of the sweetest people I've met. Save yourself some time and just go there. Everyone at event venue here is sweet and ask how you've been, even though normally staff keep their heads down.